Today, I have been in Athens Ohio for one week. I taught my friend's daughter and son to sew (with a basic needle and thread) over the weekend, while their parents focused on packing for a family move to Hell's Kitchen. They left this morning! Olivia wanted to make a fox, and she wanted it to sit proudly. I suggested we make it jointed, so she could choose when it would sit and when it would stand. And so that she could learn some more advanced techniques she can use to continue challenging herself in the future. She is old enough, I believe, to master these techniques in a short amount of time. Complete, with fashionable paisley scarf! 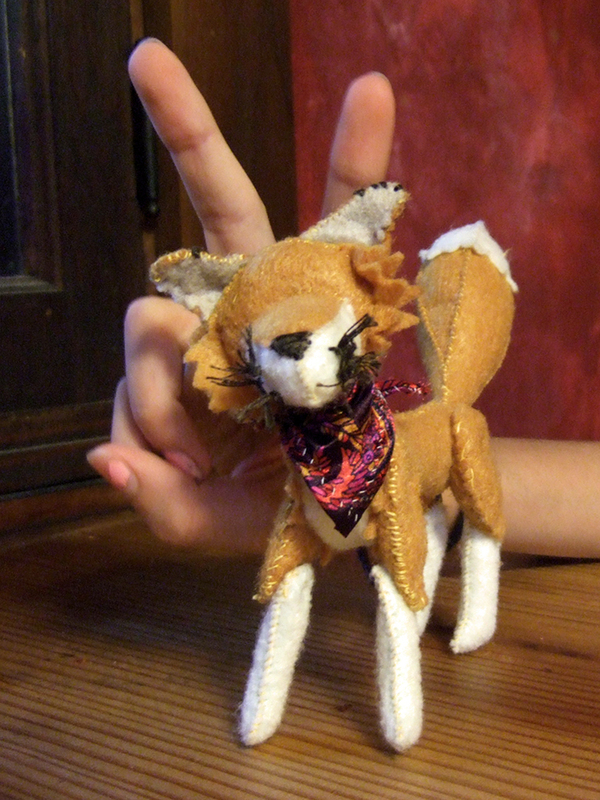 After we had finished assembling Olivia's fox, her mind was racing with ideas for other animals she hopes to make. First, she wanted to make a mouse for her fox to hunt. So we did, a very teeny tiny mouse from the same felt as her brother's burrito... And that's all we had time for, really, so she'll have to work out how to make a wolf, a walrus, and a penguin on her own. Or with her mother's help! I can still hear Olivia asking her mother if they can visit a fabric store in New York for supplies. The school year doesn't start in New York for another week or more, so... I suppose Olivia's self-assigned sewing projects could be a good way to pass the time?